· AbbVie (NYSE:ABBV): Q3 EPS of $0.89 beats by $0.12. · Revenue of $5.02B (+7.7% Y/Y) beats by $200M. · Rockwell Collins (NYSE:COL): FQ4 EPS of $1.27 in-line. · Revenue of $1.4B (+14.8% Y/Y) beats by $40M. September personal income rose 0.2% versus expectations of 0.3%; personal spending declined 0.2% versus estimates of an increase of 0.1%. Ooops. The Morning Call---Time for a mea culpa? The indices (DJIA 17195, S&P 1994) put in a strong performance as a follow through to Wednesday’s Fed meeting. The Dow busted through the upper boundary of its short (15857-17158) and intermediate (15132-17158) term trading ranges. If it closes above 17158 next Tuesday, the short term trading range will re-set to an uptrend; if it finishes above that level on Wednesday, the intermediate term trend will re-set to up. It also ended within a long term uptrend (5148-18484) and above its 50 day moving average. The S&P closed within a short term trading range (1820-2019), an intermediate term trading range (1740-2019), a long term uptrend (771-2020) and above its 50 day moving average. Volume was up slightly; breadth improved but not as much as one might expect given the pin action. But the Market remains dramatically overbought. The VIX fell, finishing within a short term uptrend, an intermediate term downtrend and above its 50 day moving average. The long Treasury rose for a second day in a row (notwithstanding no more QE and an assumed improvement in the economy), closing within a very short term trading range, a short term uptrend, an intermediate term trading range and above its 50 day moving average. GLD plunged for a second day, confirming the break of the lower boundary of a very short term trading range and re-setting to a downtrend. It joins short and intermediate term downtrends and below its 50 day moving average. Bottom line: the pin action remains somewhat surprising to me. Though there are a number of factors that could explain it. First, the Market has gotten extremely overbought. It is also true that November starts the best six months of the year. It also starts the holiday season which traditionally has an upward bias. Plus, investors are responding to the polls that look bleaker by the day for the democrats. This push to upside will likely only have a lasting impact if it can reverse many of the divergences which exist in the Market’s internal structure. I am not suggesting that it won’t happen; it just hasn’t yet and until it does, this rally has be viewed with some suspicion. I would use any rise in prices to Sell stocks that are near or at their Sell Half Range or whose underlying company’s fundamentals have deteriorated. Overseas, German regional CPI’s were almost all negative, suggesting deflation. And a second round of negotiations between Russia and Ukraine on winter gas prices ended in failure. Not surprising, but no one cared. (1) the Bank of Japan tripled down on QE, announcing not only a step in the size of its securities’ purchases. It also lowered its forecast for Japanese GDP growth. Hmmmmmmmm. This reminds of a good friend of mine that had a bunion. The remedy he used was a liquid that instructed ‘two drops once a day’. Thinking that if two drops were good, four or five would be great, he created a hole in his foot the size of a quarter. (3) Putin tells the world [especially the US] the rules of international negotiation have changed. (4) finally, Russia and Ukraine reached an agreement on the price of winter gas sales. But so far I can’t find the terms of this agreement. The other thing that occurred was some mudslinging between the US and Israel. The ill feelings apparently stem from US policy towards Iran which seems to be headed in the direction of accepting Iran as a nuclear power. Given Israel’s perception that this represents an existential threat, it is not surprising that emotions are a bit frayed. Figuring out how this resolves itself is beyond my pay grade; but it seems like an issue that could pose a problem to stability in the Middle East. Bottom line: if the last two days Market action are reflective of how asset prices are going to respond to the ending of QE, then I better start quickly with the mea culpa. Certainly, I have been wrong within this limited timeframe; and it may be that this will be one of my worse ‘swing and a miss’. Of course, it may be that it is not the end of US QE that marks the beginning of asset re-pricing but the end of global QE. As noted above, the Japanese have tripled down on their ‘all in’ QEInfinity. That will keep the liquidity pumps running full steam and provide at least some support for asset prices. So it may be that we are just in the final throes of QE; and as long as there is someone out there spewing free money into the system, asset prices will hold. So I am going to give it a bit more time before declaring myself an idiot. It may not matter; but you never know. In the meantime, I have already started playing with plugging more upbeat assumptions in our Economic Model. The problem is, as I have reported on past occasions when I did the same, that the growth rates necessary to get valuations close the current level have to be historically unprecedented, for periods historically unprecedented with interest rates remaining at very low rates for an extended period of time; and the probability of that happening has to at virtually 100%. You can see the dilemma. Perhaps it is not the end of US QE that precipitates a realignment in values---so on that call I may have been wrong. But there may be another trigger that to date, I haven’t figured out. Meanwhile, I can’t make the valuation numbers work except on what appears to me to be very unrealistic positive assumptions. (4) a stock buyback program. (4) increasingly hostile business environment in Russia. Note; BFB stock made great progress off its March 2009 low, quickly surpassing the downtrend off its August 2008 high (straight red line) and the November 2008 trading high (green line). 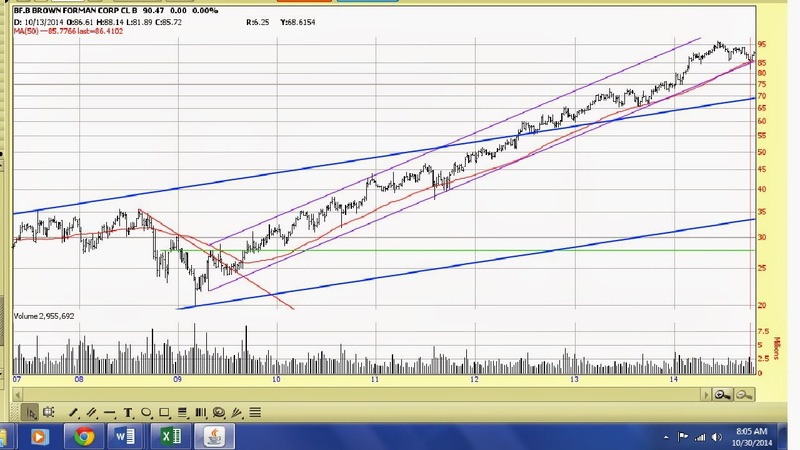 Long term it is in an uptrend (blue lines). Intermediates term it is in an uptrend (purple lines). The wiggly red line is the 50 day moving average. The Dividend Growth Portfolio owns a full position in BFB but that is due to Selling Half in mid 2012 and the stock continuing to rise (reminder, our discipline is to only Sell Half once). The upper boundary of its Buy Value Range is $36; the lower boundary of its Sell Half Range is $65. · MasterCard (NYSE:MA): Q3 EPS of $0.89 beats by $0.11. · Revenue of $2.5B (+12.6% Y/Y) beats by $50M. · Altria (NYSE:MO): Q3 EPS of $0.69 beats by $0.01. · Revenue of $4.75B (-0.2% Y/Y) beats by $20M. · ConocoPhillips (NYSE:COP): Q3 EPS of $1.29 beats by $0.09. Weekly mortgage applications fell 6.6% while purchase applications were down 5.0%. Weekly jobless claims rose 3,000 versus expectations of a 3,000 decline. The initial third quarter GDP report showed a 3.5% advance down from the second quarter number of 4.6% but better than estimates of 3.0%; the GDP deflator was +1.3% versus forecasts of +1.4%. The Morning Call---Will history repeat itself? The indices (DJIA 16974, S&P 1982) waffled around yesterday, as investors anticipated the Fed statement, then tried to figure out what it meant. The Dow finished above the upper boundary of its short term downtrend for the third day, thereby confirming the break and re-setting to a trading range (15857-17158). It also ended within an intermediate term trading range (15132-17158), a long term uptrend (5148-18484) but above its 50 day moving average. The S&P closed within a short term trading range (1820-2019), an intermediate term trading range (1740-2019), a long term uptrend (771-2020) but above its 50 day moving average. Volume was low again; breadth deteriorated. By one measure, the Market is still overbought. The VIX rose, ending within a short term uptrend, an intermediate term downtrend and above its 50 day moving average. The long Treasury rose (despite the end of QE), closing within a very short term trading range, a short term uptrend, an intermediate term trading range and above its 50 day moving average. GLD declined, closing below the lower boundary of its new very short term trading range; a finish below that boundary today, it will re-set to a downtrend. 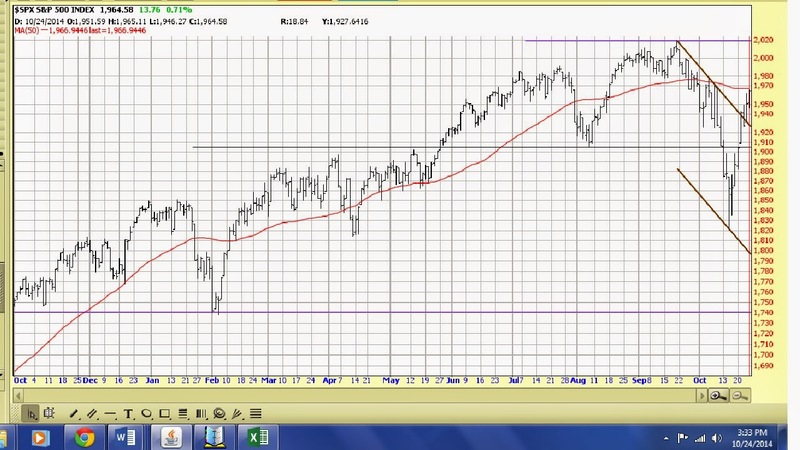 It remains within short and intermediate term downtrends and below its 50 day moving average. Bottom line: I was a bit surprised by the lack of reaction to the ending of QE and what seemed to be a more hawkish stance by the Fed. Listening to the media pundits, there was the usual confusion about what it all means and that may be as much the reason for the tempered response as anything. Further, it is not like this move wasn’t telegraphed well in advance (already discounted? ); although to be fair, the regional Fed chiefs did their best to cloud the issue and raise hopes that QE might be extended (or not). Short term, trading is apt to influenced by the extreme overbought condition of the Market. Longer term, those divergences are still there and a major prop to investor psychology has been removed. Now the issue is, do investors have sufficient confidence that the economy has more to go on the upside and that the Japanese and EU economies will have little effect? Very little economic news yesterday, either from the US or overseas. The sole number was weekly mortgage and purchase applications which were both down. (4) however, it made no changes in the language on interest rates, leaving in the ‘considerable period of time’ wording. The general reading of this statement was that it was much less dovish than prior ones. The $64,000 question is, is it really pushing the economy out of the QE nest and how will that impact the economy and more importantly the markets? Bottom line: we about to see if my thesis that an end of QE will have little effect on the economy but a major influence on asset pricing. History suggests that the market reaction will not be positive. The other thesis about to be challenged is whether or not Japan and the EU are sliding toward recession and that this will impact growth in the US. I wait with bated breathe. That said, stocks are still overvalued even if I am wrong on both counts. · Cummins (NYSE:CMI): Q3 EPS of $2.32 beats by $0.04. · Revenue of $4.9B (+14.8% Y/Y) beats by $180M. Sherwin Williams (NYSE:SHW): Q3 EPS of $3.35 beats by $0.15. Revenue of $3.15B (+10.5% Y/Y) misses by $20M. · Automatic Data Processing (NASDAQ:ADP): FQ1 EPS of $0.62 beats by $0.02. · Revenue of $2.57B (+8.9% Y/Y) beats by $20M. · Praxair (NYSE:PX): Q3 EPS of $1.62 misses by $0.01. · Revenue of $3.14B (+4.3% Y/Y) misses by $30M. · Western Gas Partners (NYSE:WES): Q3 EPS of $0.60 beats by $0.01. · Revenue of $346.5M (+24.6% Y/Y) misses by $2.19M. · C.H. Robinson Worldwide (NASDAQ:CHRW): Q3 EPS of $0.85 beats by $0.05. The October Markit flash PMI came in at 57.3 versus expectations of 58.0. September pending home sales rose 0.3% versus estimates of up 0.8%. The October Dallas Fed manufacturing index was reported at 10.5 versus forecasts of 7.5. The International Council of Shopping Centers reported weekly sales of major retailer up 0.3% versus the prior week and up 3.8% on a year over year basis; Redbook Research reported month to date retail chain store sales up 0.3% versus the comparable period last month and up 4.4% versus the similar timeframe a year ago. September durable goods orders fell 1.3% versus expectations of +0.9%. The August Case Shiller home price index declined 0.1% versus estimates of +0.1%. October consumer confidence came in at 94.5 versus forecasts of 86.8. The October Richmond Fed manufacturing index was reported at 20 versus an anticipated reading of 10. The indices (17005, 1985) had another gangbusters day. The Dow finished above the upper boundary of its short term downtrend (15665-16745) for the second day; if it remains above that level through the close on today, the trend will re-set to a trading range. It also ended within an intermediate term trading range (15132-17158), a long term uptrend (5148-18484) but above its 50 day moving average. The S&P closed above the upper boundary of its a short term downtrend for the third day, thereby confirming the break and re-setting to short term trading range (1820-2019) It also finished within an intermediate term trading range (1740-2019), a long term uptrend (771-2020) but above its 50 day moving average. Volume was abysmal; though breadth improved. By one measure, the Market is increasingly overbought. The VIX fell 10%, ending within a short term uptrend, an intermediate term downtrend and below its 50 day moving average. The long Treasury fell, closing within a very short term trading range, a short term uptrend, an intermediate term trading range and above its 50 day moving average. GLD rose, remaining within a very short term trading range, short and intermediate term downtrends and below its 50 day moving average. Bottom line: the ‘don’t fight the Fed’ crowd continues to provide upside momentum; although volume is terrible and equities are in extreme overbought territory. I continue to feel completely out of touch with Market sentiment. When I am, it is always best to do nothing. Nonetheless, I would use any rise in prices to Sell stocks that are near or at their Sell Half Range or whose underlying company’s fundamentals have deteriorated. We had a full plate of US economic data yesterday: the August Case Shiller home price index fell versus expectations of an increase, September durable goods orders both the headline number and the ex transportation reading were both negative versus estimates of a rise, weekly retail sales were positive, the October consumer confidence index was a blowout number as was the October Richmond Fed manufacturing index. By volume this data was a plus; however, the durable goods orders were by far the most important, so I would judge the day as a wash.
Overseas, there were no reported stats; however, there was a slew of negative articles on China, Japan and the EU. None of this made any difference because the QEInfinity dreamweavers were anticipating some kind of good news out of the Fed today. Maybe so. Bottom line: if the Fed stays loose, it would seem to indicate that the EU recession/deflation scenario is alive and well and living in the Eccles Building. If it tightens, well we are back of looking at the charts following QEI, II and III---which were not pretty. I won’t even attempt to guess what Yellen et al will do today. But I am unshaken in our investment strategy. The S&P is in the midst of a challenge to its short term downtrend. A close above the upper boundary of this trend today will re-set that trend to a trading range (by the way, the Dow finished above the upper boundary of its short term downtrend on Friday; and if that holds through tomorrow night, it too will re-set to a trading range). The S&P ended within an intermediate term trading range, a long term uptrend and above its 50 day moving average. The long Treasury traded down last week, breaking its very short term uptrend and re-setting to a trading range. 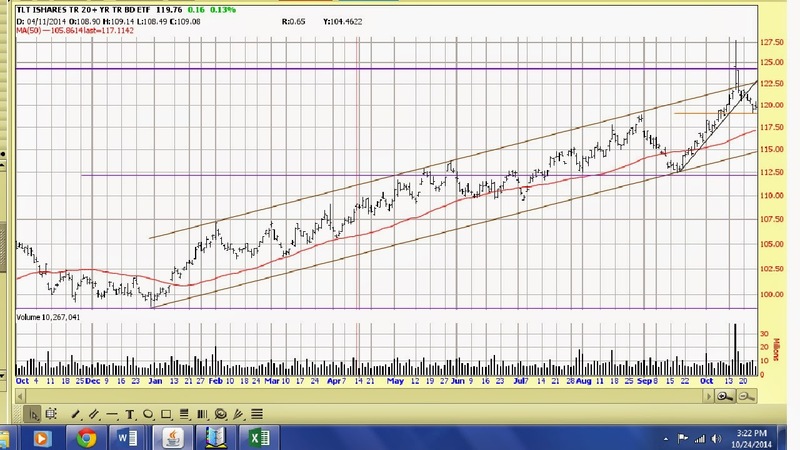 It remains within a short term uptrend, an intermediate term trading range and above its 50 day moving average. 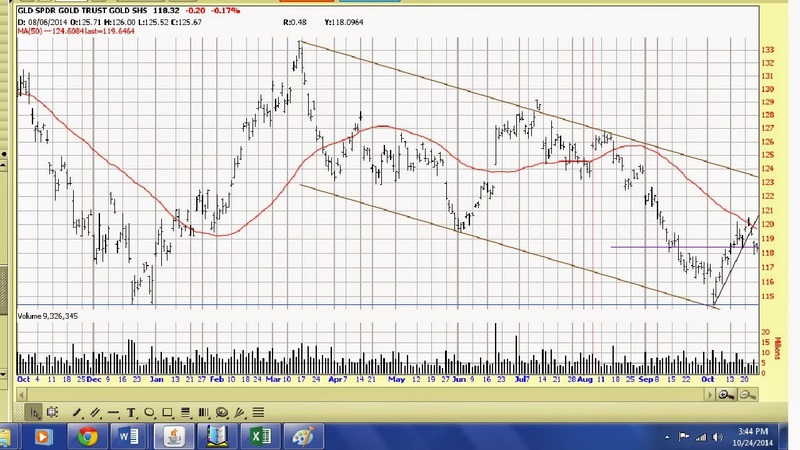 GLD broke below the lower boundary of its very short term uptrend and confirmed the break. It re-set to a trading ranges. GLD remains within short and intermediate term downtrends and below its 50 day moving average. 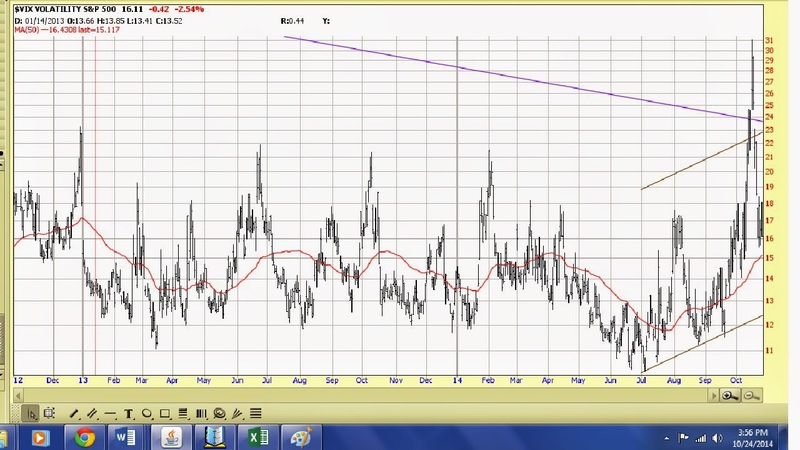 The VIX fell but stayed within its short term uptrend, intermediate term downtrend and above its 50 day moving average. The FOMC meets Tuesday and Wednesday this week; this is the meeting where QE is supposed to come to a halt. Even if it does, my guess is that the language in the statement following the meeting and the minutes will be so dovish, it will make me want to puke.